The Albany Chamber partners with the Solano Avenue Association to offer a mixer the first Wednesday of every month. These popular mixers provide members and prospective members an opportunity to meet business colleagues and network in a casual atmosphere. Visit the events page to see when and where the next mixer is scheduled. Introduced in 2017, the Chamber teams with the City of Albany to recognize the outstanding businesses who call Albany their home. Businesses are nominated by the public, and then the public votes on those nominees. The nominees and winners are recognized at a gala event in late September during Albany Local Week. Here is the most recent list of nominees and winners. Opening a new business or expanding an existing business? 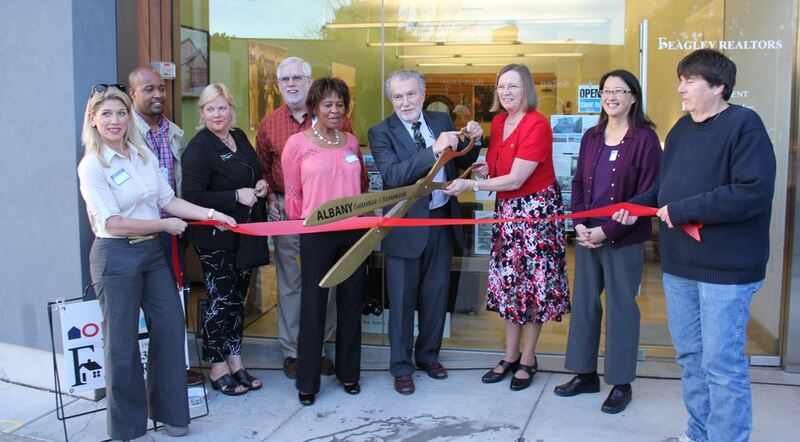 We’re happy to show up with our giant scissors and offer an official ribbon cutting. We invite the Mayor and City Council members to participate, as well. This is a fun way to bring attention to new and growing businesses. This is a small activity, but one of our most popular! For more than 35 years, the Chamber of Commerce has hosted a free ice-cream giveaway at the City’s Fourth of July Celebration. This fun event has been offered in memory of long-time Board Member Swarna Matz, former owner of Bright Star Montessori School. Mechanics Bank and the Chamber of Commerce annually produce Albany’s Holiday Mixer in early December, on of the most popular business networking events of the year. It also serves as a showcase for our local restaurants’ delicious international arrays of food.